Today I will Publish Two Post . I was unable to publish my letter D post on Saturday. My daughter left for Paris, after a week long nightmare of trying to replace a lost passport with one of those 24 hour Rush my passport services. My husband had to fly from Louisiana to D.C. on Friday, pick up her passport and return the same day. I won't go into the details. It is long and I am I am still irate. 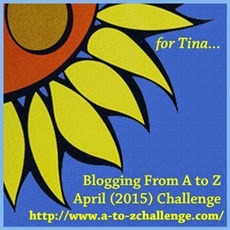 It's the content of another post after the A to Z Challenge. So please accept my apology. You will have to endure two post on one day, so I can play catch up. Digital forensics is the recovery, investigation and use of information found in digital devices. Digital forensics is the forensic examination of electronic media. We used to think of digital forensics as computer forensics, but as technology has evolved, investigators are learning as much or more about crimes with cell phones, smart phones and even gaming devices some of think of us as toys. It is a two- step process. First the investigating officer must seize or take possession of the digital device, then make a copy of the data, (forensic imaging) then analyze the data for evidence of a crime. Law enforcement officers often find information that leads them to collect additional evidence against a suspect. The ability to acquire and study data from smart phones & tablets has opened up a whole new world for law enforcement. I am not going to go into the law or the arguments for and/or against searching and seizing smart phones, nor am I going to talk about the 4th amendment and when the police are required to obtain a search warrant. That, is a lengthy and controversial topic that requires a separate post. Smart phones and other cell phones contain a wealth of information for police officers and have become a regular part of criminal investigations. Almost everyone owns a smart phone and these devices store information about a person's whereabouts. This information alone, can make or break a person's alibi in a criminal case. Our smart phones also contain the names and contact information of the people we associate with, content of our text messages, our monthly/daily calendars and so much more. We store our photos on our digital devices. Many of us keep a diary on our smart phones. Most of us take and store notes on our phones or tablets. Every time we use our cell phone a signal is sent out that pinpoints where we are. Consider this: Is there anything currently on your phone or have you deleted anything from your phone, that would embarrass or implicate you? Do you now have or have your ever had anything on your phone that you would not want others to access? Calendar Entries e.g. "bikini wax tomorrow at noon." Just to name a few of the hundreds of things law enforcement and/or hackers can access. Unless you are a computer expert, yourself, anything you've deleted is also fair game. Personally, I find value and security in the apps that allow me to know locate my children. I don't use these apps to spy on them, but to keep them safe. However, as technological growth continues, criminals should be aware that the police have more and more tools at their disposal. Some of us don't mind this and other people, non criminals, just ordinary citizens, view this an invasion of privacy. If you are playing along with my A to Z Crime Fiction Mystery. Below you will find additional facts and clues that pertain to the case. When we left off, Detective Coker and his men were eagerly awaiting results from the crime lab and from the medical examiner's office. As in real life, this is the Monday, following the Easter weekend and thus the detective has not received any new scientific information. He placed calls all morning asking that all evidence be expedited, but, with the current backlog, he does not expect to hear back from any of the agencies today. From his own investigation he learned that the victim's husband, Thomas Clinton owns a .22 Caliber handgun, but when Thomas Clinton was asked about his gun, he told the officers that believes it was stolen. No, he did not file a police report. Thomas Clinton denied knowing anyone who owns a .38 caliber weapon. Thomas Clinton further stated that his wife was taking a new antidepressant but he did not know the name of it. Clinton got angry with Detective Coker for embarrassing him at his law office. He will no longer cooperate in the investigation and instructed Detective Coker that if he has additional questions, he should contact his lawyer. Detective Coker has been unable to locate the Clintons' tenant. According to the tenants girlfriend, the nurse, the tenant was visiting his parents in Florida for the Easter break. He is recovering from another operation or procedure of some sort for his cancer. This is the first that Detective Coker has heard about the tenant's illness. He makes a mental note to do a thorough investigation into this tenant's background and find out the relationship, if any, between the tenant and his landlord(s), the Clintons. Detective Coker did catch one lucky break. He obtained the cell phone records belonging to both Martha and Thomas Clinton. He will need to have someone in the IT department take a look at them because the phone records are very puzzling to him. Martha had several incoming text messages from her husband on the days and nights leading up to her death. Some of the text messages contain words that could be construed as a threat: "You try to leave me and you'll be sorry." "You can have your divorce, but you will never get half of my money." Detective Coker was able to match up most of the text messages with the husband's phone, but some, (the threatening ones), they appear on Martha's cell phone as originating from her husband's cell phone number -- and -- on her cell phone bill, her husband's mobile number appears as the number that the text messages originated from ... something doesn't add up. Upon further examination of the husband's cell phone records, none of the incoming, threatening messages coincide with outgoing text messages from Thomas Clinton's cell phone number to his wife's cell phone number. How can the number appear on the wife's statement as the telephone number that the text message originated from, but not appear as an outgoing message on the husband's statement? Not being as computer savvy as the newer detectives and the digital forensic techs, Detective Coker decides it would be best to wait for an IT expert and a digital forensics expert to run through the cell phone records of both Mr. & Mrs. Clinton. Surely the IT guy can explain the discrepancy. If the IT department can't get to the bottom of this mystery, he will have to wait for a full report to come back from the digital forensics expert at the crime lab. Detective Coker has already transferred Mrs. Martha Clinton's cell phone and iPad to the crime lab, but it looks like he is going to need a warrant to seize Mr. Thomas Clinton's cell phone and other digital devices. He knows that the digital forensic techs will need the actual devices. Does he even have probable cause for a warrant for the husband's cell phone and other digital devices. Not sure, he'd better run the issue by the assistant district attorney as soon as he can. Hopefully, the IT guys in his own department can make sense out of this text message nonsense. He felt out of place in today's digital world. Weird huh? Can any of you explain the discrepancy? My letter E post will be up later today. If you need a recap on what has occurred so far, click on my Legal Fiction page, at the top of my blog, in the navigation area. There you will find all of the facts, clues & evidence that we know so far. Nothing in my phone that would implicate me of anything. Scary that phones can reveal where you have been in the physical. I'm sure there are all kinds of things that could be misconstrued on my systems. I love how this older detective has all these techy clues, but doesn't trust his own judgement with new technology. Interesting discrepancies. This mystery is really fun. I must admit, I do resort to some tech detective-ing to check up on my son who is across the world and rarely calls anymore. I'm still a bit of a Luddite and don't own a smart phone, but I may have my fair share of questionable Google searches for research! Unfortunately, I'm as in the dark as Coker over this conundrum. I love forensics!!! Any kind so this was a treat! I had thought this would be something I would have loved to been in, crime and times has changed so much... this was a great post. Welcome in the letter "D"... thank you! Interesting. I know that smart phones are subject to espionage. When we travel to Russia, we're not allowed to use smart phones anymore because they tap all foreign phones (I guess US do the same). We get one of these old Nokia phones, with anonymous SIM card to use while in Russia. Ugh. Sounds like you just dealt with a passport nightmare. The stuff on my phone would bore someone to death. Nothing as interesting as getting a bikini wax, anyway. Some days I think of all the things I google to write books...I could look like a real demented wacko. Just this week, I googled stealing identities and faking a death. No kidding. Don't do anything on your phone, tablet, or computer that you would ever want becoming public knowledge. Frightening, isn't it? No kidding. Especially for writers. Thank you! I needed that. I am hearing both sides of it: we are good parents for doing it & also that we went too far and have overindulged. The problem with that theory is that it was our fault that we needed the expedited passport, not my daughters so I didn't want her to be penalized for our carelessness. Second, like others have said, the cost of flying to DC (while expensive, yes) was a drop in the bucket to the cost we had paid out monthly for over a year in anticipation of her trip. Thanks for understanding. I am trying so hard to catch up. I haven't heard the word luddite in a long time. I like that word, At least you could explain your questionable searches by attributing them to writing research. I don't know many people who don't own smart phones, but those who don't tell me that they value their privacy too much. Thank you for visiting my page as well. My daughter, Blake is having the time of her life in Paris. Thanks for visiting and I will be back to visit your blog more this week. Yes, crime and forensics are both interesting topics. Good idea. And yes the government can tap our phone in the US as well. Whether or not it is legal or falls under the Patriot Act is a topic of much controversy. I was joking about the bikini wax, well maybe, LOL. The cell phone numbers is a bit of a mystery but provides, or will provide a valuable link to the killer. Thank you for taking the time to read all of it and for participating. I got stuck when planning it, between not wanting the mystery to be too difficult because I know everyone has so much going on this month, but I also didn't want it to be so easy that everyone had it figured out by the end of week three. The thing that bothers me is when ads pop up on various sites based on something I Googled days earlier. Sometimes I even forget I searched a topic. Why is Facebook and Dear Abby trying to sell me dog food? Oh, because I was researching a recall last week. Sometimes it's really scary. If I were writing crime drama I would be terrified!